This summer, businesses all over the country will be holding their company picnics. Due to insurance and liability issues, many of these events now have a one, or two drink limit for attendees. 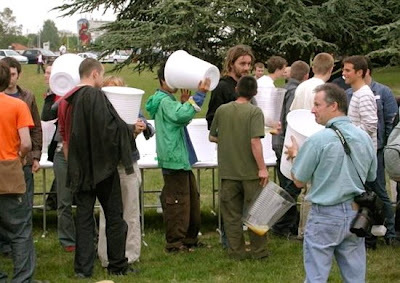 Well, as a public service I've posted the photo below, just in case you're given the assignment of buying the cups. Enjoy! And then one can recycle the "cup" to catch the hurl after. My old Uncle's Dr limited him to one drink a day and he pretty much got a cup that big. What company is this and are they hiring?